Saint John the Divine's vision of the events leading to the Second Coming of Christ at the end of time, commonly known as the Apocalypse, inspired the creation of many illuminated manuscripts in England in the 1200s. Western Europeans particularly popularized the text at this time because of recent cataclysmic events, including the Tartars' invasion of Russia in the 1230s and the fall of Jerusalem to the Moslems in 1244. These events raised fears that the end of time was at hand. Every page of the Dyson Perrins Apocalypse, named after a previous owner of the manuscript, contains a brief passage from the Apocalypse written in black ink, a portion of a popular commentary written by a monk named Berengaudus in red ink, and a half-page miniature. The miniatures, executed in a sophisticated tinted drawing technique, faithfully follow Saint John's exceptionally vivid descriptions of his visions and do not particularly reflect Berengaudus's commentary. The illuminator incorporated Saint John experiencing his vision into the majority of scenes, lending authority and a sense of immediacy to the images. As a result, the reader vicariously witnesses the horrific and awesome events unfolding in the Apocalypse along with the saint. James, Montague Rhodes. The Trinity Apocalypse (London: The Roxburghe Club, 1909), pp. 11, 15, 17, 25. James, Montague Rhodes. Estoire de Seint Aedward le Rei (Oxford, 1920), pp. 32, 34. Warner, George. Descriptive Catalogue of Illuminated Manuscripts in the Library of C. W. Dyson Perrins. 2 vols. (Oxford: Oxford University Press, 1920), vol. 1, pp. 34-40, under no. 10; vol. 2, pl. X.
James, Montague Rhodes, and Charles Harry St. John Hornby. The Apocalypse in Latin and French (Bodleian Ms. Douce 180) (London: The Roxburghe Club, 1922). Millar, Eric George. English Illuminated Manuscripts from the Xth to the XIIIth century (Paris and Brussels, 1926), pp. 60-61, 125. Matejcek, Antoní. Velislavova Bible: A její místo re vyvoji Knizní ilustrace gotické (Prague, 1926), pp. 47-48. Saunders, O. Elfrida. English Illumination (Paris and Florence, 1927), pp. 84-87. James, Montague Rhodes. The Apocalypse in Latin: Ms. 10 in the Collection of Dyson Perrins (Oxford, 1927), facsimile. James, Montague Rhodes. The Apocalypse in Art: The Schweich Lectures of the British Academy, 1927 (London, 1931), pp. 15, 54. Burger, L. Die Himmelskönigen der Apokalypse in der Kunst des Mittelalters (Berlin, 1937), pp. 64-65. Willoughby, Harold R. The Elizabeth Day McCormick Apocalypse (Chicago,1940), pp. 145, 262, 433, 446, 484. Oakeshott, Walter. The Sequence of English Medieval Art (London, 1950), p. 47, pls. 32, 33. Klingender, Francis D. "St. Francis and the Birds of the Apocalypse." Journal of the Warburg and Courtauld Institutes 16 (1953), pp. 17f. Rickert, Margaret. Painting in Britain: The Middle Ages (Harmondsworth, 1954), pp. 110, 112, 237 (n. 83). Freyhan, Robert. "Joachism and the English Apocalypse." Journal of the Warburg and Courtauld Institutes 18 (1955), pp. 219, 224 (n. 4), 232-33. Brieger, Peter H. English Art, 1216-1307 (Oxford, 1957), pp. 166-68. Vaughan, Richard. Matthew Paris (Cambridge, 1958), p. 226. Diringer, David. The Illuminated Book, its History and Production (London, 1958), p. 271. Aurenhammer, Hans, ed. "Apokalypse." In Lexikon der christlichen Ikonographie vol. 3 (1961), p. 197. Edmunds, Sheila. "Manuscripts and Illumination in the Duchy of Savoy." Ph.D. diss. (Columbia University, 1961), pp. 42ff., figs. 25, 35, 37-39. Edmunds, Sheila. "The Missals of Felix V and Early Savoyard Illumination." The Art Bulletin 46 (1964), pp. 134-35. Poesch, Jessie J. "Antichrist Imagery in Anglo French Apocalypse Manuscripts." Ph.D. diss. (University of Pennsylvania, 1966), pp. 263-68, 270, 272, 312, 352, 354, figs. 95-98. Henderson, George. "Studies in English Manuscript Illumination, Part III: The English Apocalypse II." Journal of the Warburg and Courtauld Institutes 31 (1968), pp. 103-47. May, Helmut, ed. Weltkunst aus Privatbesitz, exh. cat. (Cologne: Druckerei J. P. Bachem, 1968), no. D 59. Hoegger, Peter. "Ottonische Apokalypsen." Unsere Kunstdenkmäler: Mitteilungsblatt für die Mitglieder der Gesellschaft für schweizerische Kunstgeschichte 20, Heft 3/4 (1969), p. 105-8. Henderson, George. "An Apocalypse Manuscript in Paris: B. N. MS Lat. 10474." The Art Bulletin 52 (1970), no. 1, pp. 22ff. Verdier, Philippe, Peter Brieger, Marie Farquhar Montpetit. Art and the Courts: France and England from 1259 to 1328, exh. cat. (Ottawa: The National Gallery of Canada, 1972), pp. 91-92, 94-95. Morgan, Nigel J. "Gothic Manuscripts in England." In The Book Through 5000 Years. Hendrik Vervliet, ed. (London and New York, 1972), p. 238. Vezin, Gilberte. L'Apocalypse et la Fin des Temps (Paris, 1973), pp. 104-5, fig. 63. Sandler, Lucy Freeman. The Peterborough Psalter in Brussels and Other Fenland Manuscripts (London, 1974), p. 100. Kraus, Hans P., ed. Monumenta Codicum Manu Scriptorum, exh. cat. (New York: H.P. Kraus, 1974), no. 20, pp. 50-51. Hoegger, Peter. Die Fresken in der ehemaligen Abteikirche S. Elia bei Nepi (Frauenfeld, 1975), pp. 71-86. Nordenfalk, Carl, et al. Medieval and Renaissance Miniatures from the National Gallery of Art, exh. cat. (Washington: National Gallery, 1975), pp. 63-64. Plotzek, Joachim M. "Bilder zur Apokalypse." In Die Parler und der Schöne Stil 1350-1400: Europäische Kunst unter den Luxemburgern 3 (Cologne, 1978), pp. 201-2. Kraus, Hans P. A Rare Book Saga: The Autobiography of H.P. Kraus (New York: G.P. Putnam's Sons, 1978), pp. 212, 261-265. Kraus, Hans P. In Retrospect: A Catalogue of 100 Outstanding Manuscripts sold in the last four decades by H. P Kraus (New York: H. P. Kraus, 1978), no. 27, pp. 82-85. Euw, Anton von, and Joachim M. Plotzek. Die Handschriften der Sammlung Ludwig. 4 vols. (Cologne: Schnütgen-Museum, 1979-1985), vol. 1 (1979), pp. 191-98. Pfaff, Richard W. Montague Rhodes James (London, 1980), pp. 314, 316-17. Nordenfalk, Carl. Review of Die Handschriften der Sammlung Ludwig, by Anton von Euw and Joachim M. Plotzek. Kunstchronik 33, no. 2 (February 1980), pp. 63-64. Poesch, Jessie J. "Revelation 11:7 and Revelation 13:1-10: Interrelated Antichrist Imagery in some English Apocalypse Manuscripts." In Art, the Ape of Nature: Studies in Honor of H. W. Janson. M. Barasch, and L. Freeman Sandler, eds. (New York, 1981), pp. 27-29, figs. 15, 16. Whitaker, Muriel. A. "'Pearl' and some illustrated Apocalypse manuscripts." Viator 12 (1981), p. 189. Klein, Peter. Endzeiterwartung und Ritterideologie: Die englischen Bilderapokalypsen der Frühgotik und MS Douce 180 (Graz, 1983), passim. Lancaster, R. Kent. "Henry III, Westminster Abbey and the Court School of Illumination." In Seven Studies in Medieval English History and Other Historical Essays Presented to Harold S. Snellgrove. Richard H. Bowers, ed. (Jackson, 1983), p. 86. Fisher, Linda. "Iconography and Narrative in the 'St. Albans' Apocalypses." Ph.D. diss. (Ohio State University, 1984), passim. "Manuscript Acquisitions: The Ludwig Collection." The J. Paul Getty Museum Journal 12, 1984, pp. 281 and 286. Henderson, George. "The Manuscript Model of the Angers 'Apocalypse' Tapestries." Burlington Magazine 127 (1985), pp. 210, 217, n. 20, fig. 41. Binski, Paul, and George Henderson. "Review, P. Klein, Endzeiterwartung und Ritterideologie: Die englischen Bilderapokalypsen der Frühgotik und MS Douce 180" Burlington Magazine 127 (1985), pp. 625-626. Bergamini, Larie J. "From narrative to ikon: the Virgin Mary and the woman of the Apocalypse in 13th century English art and literature." Ph.D. diss. (University of Connecticut, 1985), pp. 8, 110, 116 (n. 203), 124 (n. 208), 174 (figs. 9, 57). Emmerson, Richard, and Susan Lewis. 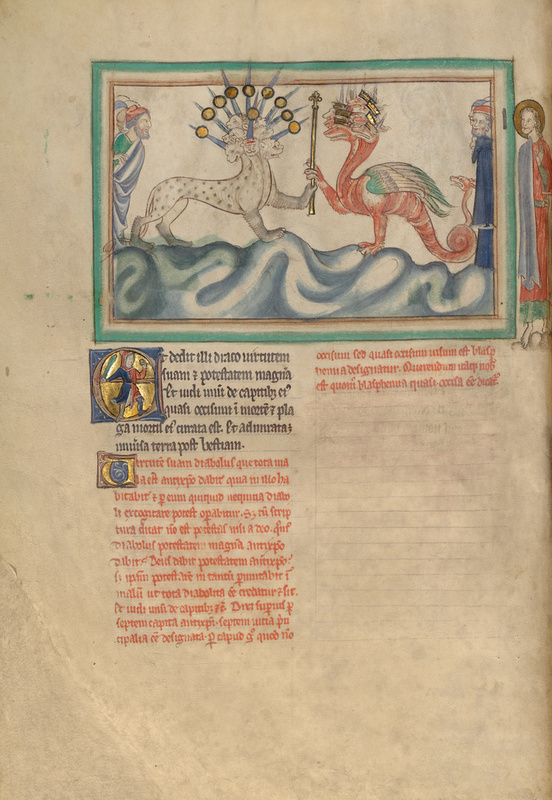 "Census and Bibliography of Medieval Mss with Apocalypse Illustrations." Traditio 41 (1985), passim. The J. Paul Getty Museum Handbook of the Collections. 1st ed. (Malibu: J. Paul Getty Museum, 1986), pp. 65, 71, ill.
Fitzgerald, Wilma. "Ocelli nominum: Names and Shelf Marks of famous/familiar Manuscripts (II)." Mediaeval Studies 48 (1986), p. 336. Morgan, Nigel. Early Gothic Manuscripts (II): 1250-1285: A Survey of Manuscripts Illuminated in the British Isles (Oxford, 1988), cat. no. 124, pp. 98-100, figs. 122-29. The J. Paul Getty Museum Handbook of the Collections. 2nd ed. (Malibu: J. Paul Getty Museum, 1988), pp. 65, 71, ill. Hamburger, Jeffrey F. The Rothschild Canticles: Art and Mysticism in Flanders and the Rhineland circa 1300 (New Haven and London, 1990), pp. 115, 265 (n. 173). Edmunds, Sheila. "Jean Bapteur et l'Apocalypse de Escorial." In Les Manuscrits enluminés des comtes et ducs de Savoie (Torino, 1990), pp. 93, 103 n.8. The J. Paul Getty Museum Handbook of the Collections. 3rd ed. (Malibu: J. Paul Getty Museum, 1991), pp. 65, 73, ill.
A Thousand Years of the Bible: An Exhibition of Manuscripts from The J. Paul Getty Museum, Malibu [...], exh. cat. (Malibu: J. Paul Getty Museum; Los Angeles: University of California, 1991), fig. 18. Lewis, Suzanne. 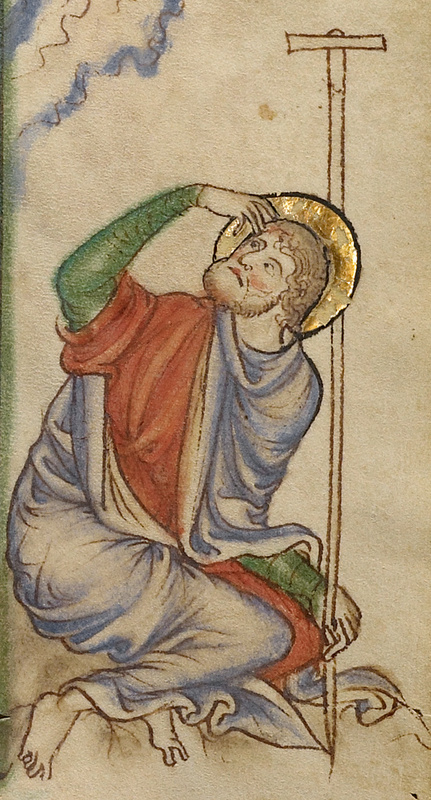 "Beyond the Frame: Marginal Figures and Historiated Initials in the Getty Apocalypse." The J. Paul Getty Museum Journal 20 (1992), pp. 53-76. Boyer, Paul S. When Time Shall Be No More: Prophecy Belief in Modern American Culture. Studies in cultural history (Cambridge, MA: Belknap Press of Harvard University Press, 1992), fig. The Final Battle. Kren, Thomas, ed. Margaret of York, Simon Marmion, and The Visions of Tondal: Papers Delivered at a Symposium Organized by the Department of Manuscripts of the J. Paul Getty Museum in collaboration with the Huntington Library and Art Collections, June 21-24, 1990 (Malibu: J. Paul Getty Museum, 1992), p. 82, fig. 34.p. 82, fig. 34. Faßbender, Birgit. Gotische Tanzdarstellungen (Frankfurt, Berlin et. al. : Lang, 1994), no. 61, fig. 27 (fol. 17v). Lewis, Suzanne. "Vision and revision: On 'seeing' and "not seeing' God in the Dublin Apocalypse." Word and Image 10, no. 3 (July-September 1994), pp. 289-311. Lewis, Suzanne. Reading Images: Narrative Discourse and Reception in the Thirteenth-century Illuminated Apocalypse (Cambridge University Press, 1995). Neff, Amy. "The Pain of Compassio: Mary's Labor at the Foot of the Cross." Art Bulletin LXXX (June 1996), pp. 257-58 (fig. 69, n. 34). Buren, Anne H. van, James H. Marrow, and Silvana Pettenati. Heures de Turin-Milan Inv. no 47, Museo Civico d'Arte Antica, Torino. (Luzern: Faksimile Verlag, 1996), pp. 114, 310, 502, no. 36. The J. Paul Getty Museum Handbook of the Collections. 4th ed. (Los Angeles: J. Paul Getty Museum, 1997), pp. 61, 70, ill. Masterpieces of the J. Paul Getty Museum: Illuminated Manuscripts (Los Angeles: J. Paul Getty Museum, 1997), pp. 33-35, entry by Elizabeth C. Teviotdale. Klein, Peter. "Initialen als 'Marginal Images': Die Figureninitialen der Getty-Apokalypse". Cahiers archéologiques 48 (2000), pp. 105-23. Maekawa, Kumiko. Narrative and Experience: Innovations in Thirteenth-Century Picture Books (Frankfurt am Main: Peter Lang, 2000), pp. 110, 117, 120, 121, pl. 41. Rivière-Ciavaldini, Laurence. "L'Apocalypse de Galois de Viry et la "Croisade" de 1366 (Paris, BNF, Ms Lat. 688)." In Art et Artistes en Savoie: Actes du XXXVIIe Congrès des Sociétés Savantes de Savoie (Thonon-les-Bains, 2000), pp. 75, 77. Rivière-Calvadini, Laurence. "Jean Colombe entre Naples et la Savoie. A propos de l'Apocalypse de ducs de Savoie. Première Partie." Arte Cristiana, Anno LXXXVIII, 798, (May-June 2000), p. 197 n.46. Rivière-Calvadini, Laurence. "Jean Colombe entre Naples et la Savoie. A propos de l'Apocalypse de ducs de Savoie. Deuxième Partie." Arte Cristiana, Anno LXXXVIII, 799 (July-August 2000), p. 266 n.70. The J. Paul Getty Museum Handbook of the Collections. 6th ed. (Los Angeles: J. Paul Getty Museum, 2001), pp. 61, 71, ill.
Graf, Katrin. Bildnisse schreibender Frauen im Mittelalter (Basel: Schwabe and Company, 2001), pp. 115-22, fig. 48. Castronovo,Simonetta.La Biblioteca dei Duchi di Savoia e la pittura in area savoiarda (1285-134) (Turin: Umberto Allemandi &. C., 2002), pp. 91-96, 100-1, figs. 62,64. Saroni, Giovanna. La biblioteca di Amedeo VIII di Savoia (1391-1451) (Turin: Umberto Allemandi, 2004), pp. 53, 63 (note 120, 185-189, figs. 42, 46). Gellrich, Jesse M. "Art of Rhetoric and the Art of the Page: Figurae in the Illuminations of the Getty Apocalyspe." In Text and Voice: The Rhetoric of Authority in the Middle Ages. Marianne Børch, ed. (Odense: University Press of Southern Denmark, 2004), pp. 168-94. Avezza, Lara. "Bapteur, Jean." In Dizionario Biografico dei miniatori Italiani. Secoli IX XVI. Milvia Bollati, ed. (Milano: Sylvestre Bonnard, 2004), p. 57. McKitterick, David, ed. 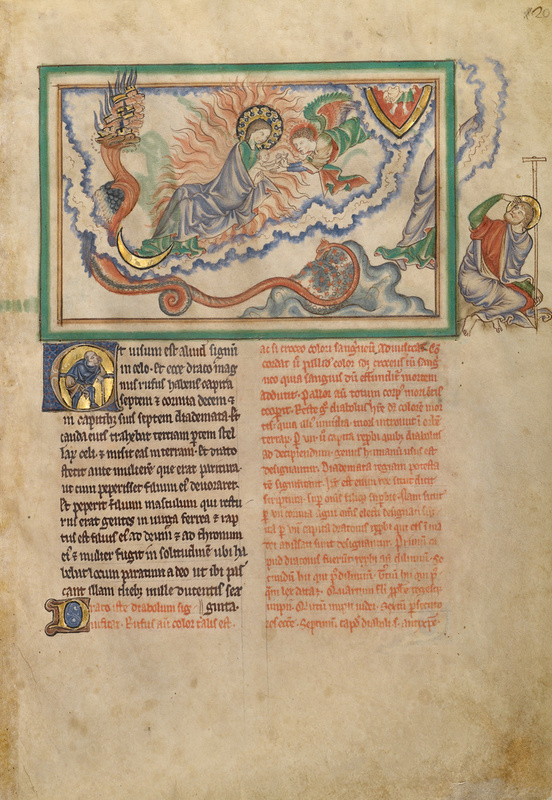 The Trinity Apocalypse (Trinity College Cambridge, MS R.16.2) (London and Toronto: The British Library and University of Toronto Press, 2005), pp. 26, 63-73, figs. 107, 112. Rivière-Calvadini, Laurence. "L'Apocalypse au Moyen Age: catastrophe cosmique ou triomphe du christianisme?." In Récits et représentations des catastrophes depuis l'Antiquité (Grenoble, 2005), p. 199, fig. 7. Rivière-Calvadini, Laurence. "L'Apocalypse de Giusto de'Menabuio à San Benedetto de Padoue." In "Tout le temps du veneour est sanz oyseuseté", Christine Hediger (ed.) (Turnhout, 2005), p. 135. Giorgi, Rosa. Angels and Demons in Art. Stefano Zuffi, ed. Rosanna M. Giammanco Frongia, trans. (Los Angeles, J. Paul Getty Museum, 2005), p. 312 (fol. 4v). Kendrick, Laura. "Making Sense of Marginalized Images in Manuscripts and Religious Architecture." In A Companion to Medieval Art: Romanesque and Gothic in Northern Europe. Conrad Rudolph, ed. (Oxford: Blackwell, 2006), pp. 274-94, esp. p. 288. Morgan, Nigel. The Douce Apocalypse: Picturing the End of the World in the Middle Ages (Oxford: Boleian Library, 2006), pp. 12, 58, 61, 65, 68, 87, 104-107. Scheller, Robert W. "Wreath and Crown: Variations and Changes in Apocalyptic Headgear." In The Cambridge Illuminations: The Conference Papers. Stella Panayotova, ed. (London/Turnhout: Harvey Miller Publishers, 2007, pp. 87-96, esp. p. 90 (n. 26). Ciavaldini, Laurence Rivière. Imaginaires de l'Apocalypse: Pouvoir et spiritualité dans l'art gothique européen (2007), pp. 90, fig. 1 (fol. 17), 106, fig. 8 (fol. 2), and 128, fig. 20 (fol. 26). Morrison, Elizabeth. Beasts: Factual & Fantastic (Los Angeles: J. Paul Getty Museum; London: The British Library, 2007), pp. 91, 98-101, figs. 78-83, ill. The J. Paul Getty Museum Handbook of the Collections. 7th ed. (Los Angeles: J. Paul Getty Museum, 2007), pp. 55, 65, ill.
Laneyrie-Dagen, Nadeije. L'invention de la nature: Les quatre éléments à la Renaissance ou le peintre premier savant (Paris: Flammarion, 2008), pp. 219-20 (detail of fol. 35). Holcomb, Melanie, ed. Pen and Parchment: Drawing in the Middle Ages, exh. cat. (New Haven: Metropolitan Museum of Art, with Yale University Press, 2009), pp. 146-47, no. 43. Ciavaldini, Laurence Rivière, ed., et. al. Entre France et Italie Mélanges offerts à Pierrette Paravy: Vitalité et rayonnement d'une rencontre (Grenoble: Presses universitaires de Grenoble, 2009), fig. 2. Sciacca, Christine. Building the Medieval World (Los Angeles: J. Paul Getty Museum; London: The British Library, 2010), pp. 48-49, fig. 46. Scott, Margaret. Fashion in the Middle Ages (Los Angeles: J. Paul Getty Museum, 2011), pp. 44-45, fig. 27. Guédron, Martial, et. al. Monstres, Merveilles et Créatures Fantastiques (Paris: Éditions Hazan, 2011), p. 125, ill.
Morgan, Nigel. Illuminating the End of Time: The Getty Apocalypse Manuscript (Los Angeles: J. Paul Getty Museum, 2011), passim. Waldmann, Klaus. "Splendore Miniato: La Miniatura Gotica al Getty." Alumina Pagine Miniate 10, no. 36 (January-March 2012), pp. 6, 47, ill.
Pedersen, Nate. "The Getty Goes Gothic." Fine Books & Collections 10, no. 1 (Winter 2012), pp. 23-24, ill.
Westermann-Angerhausen, Hiltrud. "Erlösung riechen: Weihrauch in Kunst und Kult." Sigurd Greven-Vorlesung 16, no. 21 (November 2012), pp. 29, 34n42, fig. 22. Jung, Jacqueline E. The Gothic Screen: Space, Sculpture, and Community in the Cathedrals of France and Germany, ca. 1200-1400 (Cambridge and New York: Cambridge University Press, 2013), p. 70, fig. 60.
de Hamel, Christopher. Meetings with Remarkable Manuscripts (London: Allen Lane/Penguin, 2016), p. 513, ill.